The village of Zsibrik is located 50km northeast of Pécs. It originally belonged to the county of Tolna, but after a lengthy lawsuit from 1695-1720, 26 villages – Zsibrik amongst them – were given to the county of Baranya. Zsibrik can be reached over an infamously bad street, which was not asphalted until 1995. No wonder than the village’s name is said to be coming from the German expression “Schieb zürück!” (Push it back!). Legend has it that the German settlers tried to push on their horses who had slowed down on the hard way through the valley. Up until today, the village can only be reached from Mőcsény through the Börcsin valley. Zsibrik came into the possession of the Perczel family of Bonnhard who settled the village with protestant Germans. After some time, Catholics followed as well. A record from the 18th century says that the inhabitants had trouble getting ahead, since the soil was neither fit for pasture economy nor for the profitable agri- or viticulture. Around 1830, the village consisted of 83 houses with approximately 600 inhabitants. 85 of them were Jews, since the Parczels had allowed Jewish settlement in their villages in return for extra taxation. The number of Catholics had shrunk to 5 by then. Despite the bad conditions, the inhabitants in the mid-19th century mostly worked in viticulture or the cultivation of tobacco. Also, an increasing number of people migrated. In the 1970s, Zsibrik was completely depopulated; this was firstly due to the dispossession and later displacement of Germans of Hungary after World War II and secondly due to the state settlement policies after 1970, which was directed against small villages. In the meantime, some houses are inhabited again and the number of residents amounts to 30. In 1990, the Calvinist church established a foundation to help drug-addicted youths. Some of the houses in Zsibik are now used by the foundation. 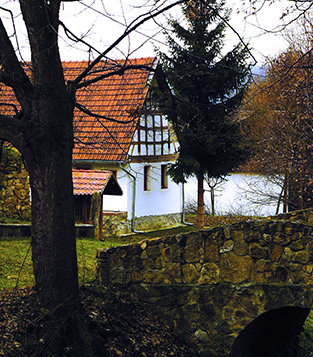 In relation to architecture, Zsibik is an important village, since two original half-timbered houses still remain today. One of them is on Kossuth Street 6. The house rests on a natural stone foundation, which is one metre high. It presumably is a house of the first colonists. Originally, it had three separate units: parlour, kitchen and chamber. The half-timbered construction is even preserved on the backside of the house. 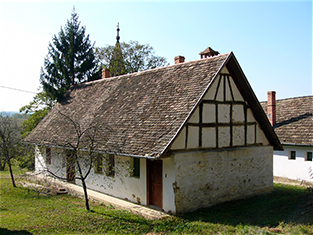 The second half-timbered house lies in the centre of the village as well, close to the protestant church on Petőfi Street 28. The house is built on natural stone as well and has an attention-grabbing lattice on its front. The interior structure was originally in four parts: parlour – kitchen and parlour – summer kitchen (with open fire). The colonists’ house was uninhabited for along time, but renovated in 1988 and is now used by the community. No asphalted streets can be found here. 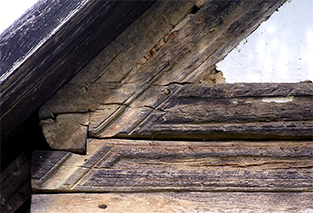 Detail of the half-timbered front. Back façade of half-timbered colonists’ house.